To assess the transferability of the magnetic resonance imaging (MRI) multislice multiecho T2* technique for pancreatic iron overload assessment. Multiecho T2* sequences were installed on ten 1.5-T MRI scanners of the three main vendors. Five healthy subjects (n = 50) were scanned at each site. Five patients with thalassemia (n = 45) were scanned locally at each site and were rescanned at the reference site within 1 month. T2* images were analyzed using a previously validated software and the global pancreatic T2* value was calculated as the mean of T2* values over the head, body, and tail. T2* values of healthy subjects were above 26 ms and showed inter-site homogeneity. The T2* values measured in the MRI sites were comparable to the correspondent values observed in the reference site (12.02 ± 10.20 ms vs 11.98 ± 10.47 ms; p = 0.808), and the correlation coefficient was 0.978 (p < 0.0001). Coefficients of variation (CoVs) ranged from 4.22 to 9.77%, and the CoV for all the T2* values independently from the sites was 8.55%. The intraclass correlation coefficient (ICC) for each MRI site was always excellent and the global ICC was 0.995, independently from the sites. The mean absolute difference in patients with pancreatic iron (n = 39) was -0.15 ± 1.38 ms. The gradient-echo T2* MRI technique is an accurate and reproducible means for the quantification of pancreatic iron and may be transferred among MRI scanners by different vendors in several centers. • The gradient-echo T2* MRI technique is an accurate and reproducible means for the quantification of pancreatic iron. 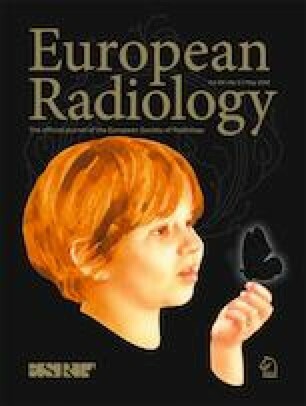 • The gradient-echo T2* MRI technique for the quantification of pancreatic iron may be transferred among MRI scanners by different vendors in several centers. • Pancreatic iron might serve as an early predictor of cardiac siderosis and is the strongest overall predictor of glucose dysregulation. We thank the patients, who gave their availability for two MRI sessions and long-distance travel within a short time. We also thank the healthy volunteers. We thank C.S. (MRI Lab Secretary) for organization skills. The scientific guarantor of this publication is Alessia Pepe.